What do other people do with their old letters? I'm sorting through one of those piles of miscellanea that haunt the corners of my life, flotsam and jetsam waiting to be tagged and filed in the appropriate place, or occasionally (not nearly often enough says Lovergirl) thrown out. 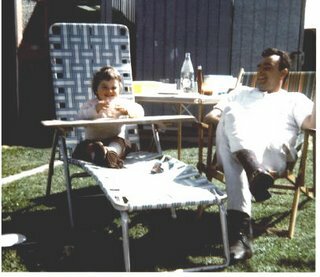 I found this letter from Dad, together with this photo of me and him in our backyard. I think he looks like Elvis. I love Dad's letters. I can hear his thick Maltese accent as he writes. Thank for the present. I had a good Christmas breakfort with mum + Zedd then I went to Maria and family for Lunch and I had sweats at Marge and Bob & David every thing has stopet for the holiday "the Chi" scare Danceing and Ballroom Danceing so Im doing a lot of gardning and lots of reading Zedd gave a book (the word of ISLAM BY GEOGE NEGUS) very interestng book. By the way "the chi" is 'tai chi' and scare dancing is square dancing. been diving here & saw turtles, sharks & heaps of fish. Weather's been great & wedding was heaps of fun. Letters from Dad make me homesick for Melbourne. It seems a shame to throw out any handwritten correspondence - it's so rare and gorgeous. I read that within the next few years Australia Post will be unprofitable - with us all communicating electronically, it's losing its economies of scale. The real turn of the screw, apparently, is the accelerating shift to electronic bills. Then stamps will go up and I will receive even fewer letters. If I was an artist I could figure out some art project to do with the snowdrifts of letters that spill out of my bookshelves. I've even got a whole suitcase full of them in the shed. I don’t want to start arguing about who’s right and who’s wrong, the finaly word is that it’s not right that civilians get hurt in the process, from both sides. I’m sending you my best wishes from here, and hope that you and your family will be strong and be alright until this horrible situation will be over. Suddenly I'm seeing a blog as a very powerful thing, an opportunity for ordinary folk to communicate without the sanitised intermediaries of mass media. It's not universally accessible yet, but imagine if we all had the ability to find out the story from the other side's perspective! How it worked on me was that I suddenly had an image of the war as affecting real people, so I wanted to know more. Shamefully, I'm not very good at being completely up to date with world events. It's so far out of my control, and changes so rapidly, there seems little point in knowing what's going on. The next bit I need to add to my yawning chasm of knowledge on this issue is what are other countries doing about it? And why or why not?